Photo requirements for Canadian passports are substantially different from the US requirements. In fact, Canadian passport photo requirements are without a doubt amongst the strictest in the world. 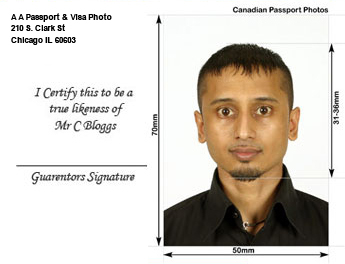 It is a requirement for Canadian passport pictures that it is done by a commercial photographer. We take and print photos that will meet those requirements. Maximum size for a Canadian passport photo is 2.75" high by 2" wide. The required dimension of the head in a Canadian passport photo is a little bigger than for the US. The photographer has to put their name and address on the back of 1 of the photos. We also must put the date that the picture is taken on the back of the photo. The image to the right is a sample of what we do on the back of our photos. A guarantor has to certify that it is a true likeness of the applicant. We are not the guarantor. 50 mm wide X 70 mm high (2 inches wide X 2 3/4 inches long). In color or in black and white. Sized so the height of the face measures between 31 mm (1 1/4 inches) and 36 mm (1 7/16 inches) from chin to crown of head (natural top of head). Original photos that are not digitally altered or taken from an existing photo. The photographer must print the name and address of the photographer or studio and the date the photo was taken. The photographer may use a stamp or handwrite this information. Stick-on labels are unacceptable. Glasses, including tinted prescription glasses, may be worn in photos as long as the eyes are clearly visible and there is no glare in the glasses. Sunglasses and red eyes are unacceptable.